The Bharatiya Janata Party has dubbed the country-wide protest call given by the Congress and several other parties an attempt to spread rumour and confusion among the masses. New Delhi: While Congress president Rahul Gandhi questioned Modi’s silence on the consistent fuel price hike, the BJP hit back saying the problem being faced by the people is momentary and is caused by global factors. Leaders of various opposition parties led by Congress president Rahul Gandhi today kickstarted a country-wide shutdown from Rajghat. 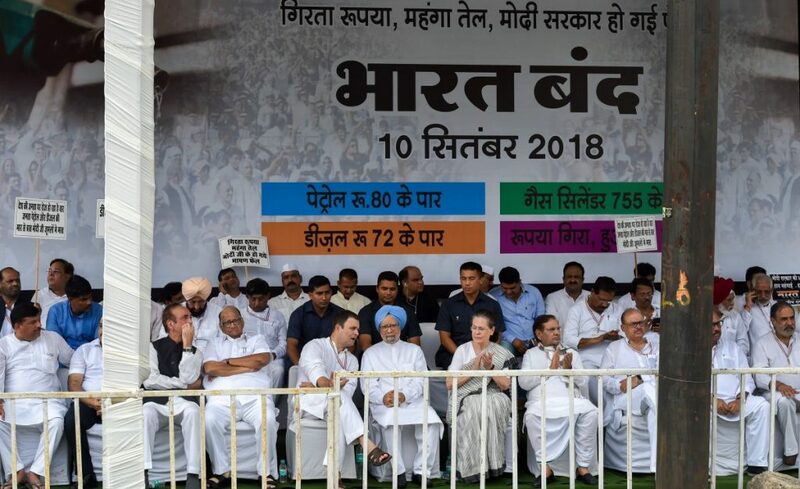 Twenty-one opposition parties, besides a number of chambers of commerce and traders’ associations, are supporting the ‘Bharat Bandh’ which has been called to protest against the rising fuel prices and the steady fall in the value of rupee. Congress has demanded that petrol and diesel should be brought under the ambit of Goods and Services Tax, by which oil prices could drop by about Rs 15-18. 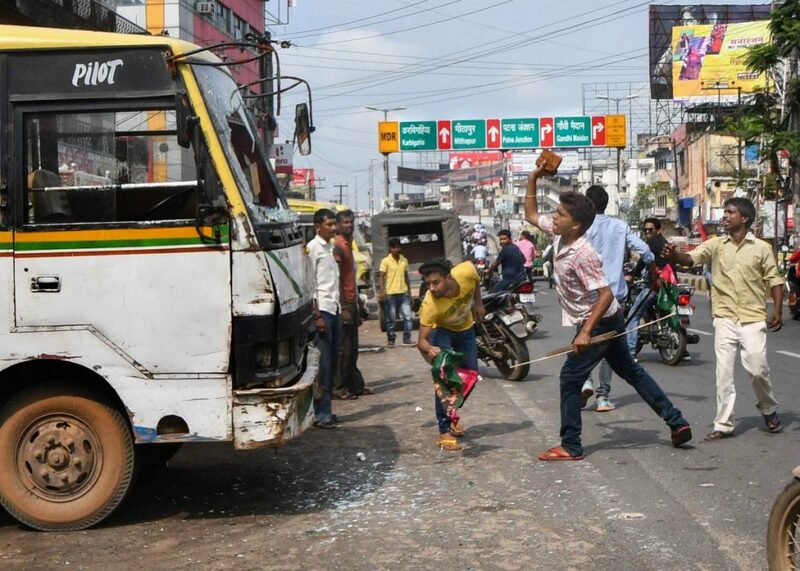 BJP’s Ravi Shankar Prasad has slammed the “violent” protests taking across the country after an infant died amid the fuel protests, Indian Express reported. “It’s the essence of democracy that hospitals, ambulances, and medicine shops are allowed to function without any hindrance. But, with the death of two-year-old in Bihar today, an environment of fear is being created,” he said. An infant died Bihar’s Jehanabad district after an ambulance carrying the two-year-old was stuck on roads due to the protest, NDTV reported. The ambulance was on its way to the civic hospital in Jehanabad. According to ANI, Andhra Pradesh chief minister Chandrababu Naidu has announced a Rs 2 cut in petrol and diesel price in the state, with the revised prices to go into effect tomorrow morning. “The Central government has been imposing a heavy burden on people by steeply increasing the prices of petrol and diesel despite heavy income in the form of various levies and dividends. Though the state is faced with a deficit budget, we have decided to reduce the tax and ease the burden on people,” Naidu said. The state would have to forego a revenue of Rs 1,120 crore due to the measure, he said. A day before the opposition-sponsored Bharat Bandh against rising fuel prices, poll-bound Rajasthan had on Sunday slashed the VAT on petrol and diesel. Chief minister Vasundhara Raje announced a 4% reduction which brought the prices of the two commodities down by Rs 2.5 per litre. 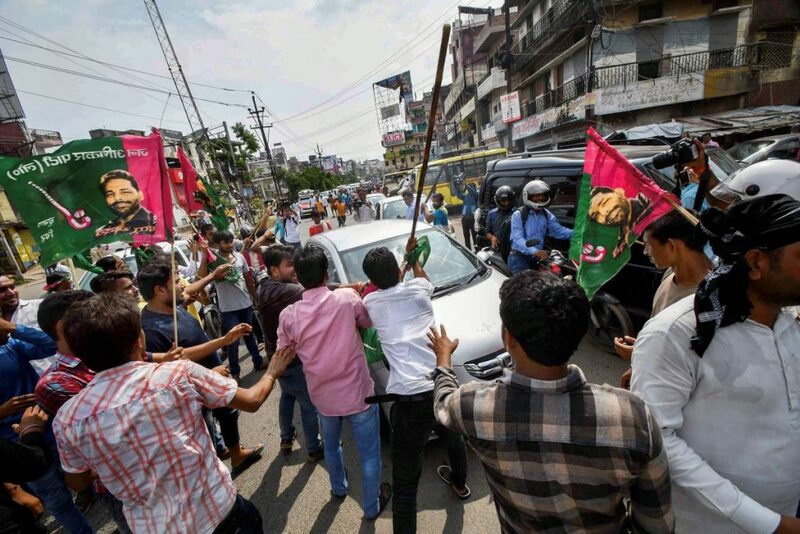 Around 400 bandh supporters were detained in different parts of Tripura for trying to disrupt normal life, a senior police officer said. The bandh call by opposition Congress and Left parties, however, failed to evoke much response in the BJP-ruled state, he added. All government offices, including the civil secretariat, conducted business as usual and public vehicles plied on roads like any other day, officiating AIG (Law and Order) Subrata Chakraborty said. “The strike was totally violence-free and no untoward incident was reported from any part of the state so far. More than 400 picketers were detained for trying to enforce bandh,” he told PTI. Some business establishments chose to remain shut in the state capital and neighbourhood areas, but normal life wasn’t affected in any way due to the bandh, he added. Fifty-eight Congress activists were taken into police custody in Jharkhand for trying to enforce the Bharat Bandh called by the party, according to a police officer. The Jharkhand Mukti Morcha, the Rashtriya Janata Dal and Left parties in Jharkhand are supporting the Congress-sponsored protest against fuel price hike. Palamau district Congress president Jaias Ranjan Pathak was among the nearly 60 activists taken into custody, superintendent of police Inderjeet Mahata said. Barring Garhwa district, normal life is not affected in Pakur, Jamshedpur, Ranchi, Hazaribagh, Lohardaga, Gumla, Ramgarh, Giridih, Latehar, Palamau, Dhanbad and other districts, according to reports. Goods trains and passengers trains were being escorted by the police, a police officer said. According to reports, vehicular traffic is normal in most parts of the state, including Ranchi. Former prime minister Manmohan Singh Monday said it was time for all opposition parties to shed their differences and move forward unitedly “to save” sovereignty and democracy in the country. The Narendra Modi government has taken a lot of steps not in the interest of the country and has now “crossed the limit”, Singh said at a protest. The former PM said all sections of society – youth, farmers and common people – are unhappy with the Modi government, which has failed to fulfil promises made to the people. He urged the parties to listen to the voice of the people and move forward to save the country and democracy. “The Modi government has done a lot which is not in national interest. Now it has crossed the limit and time is coming to change it,” he said. Train services were disrupted in many places of Odisha as Congress workers blocked railway tracks to enforce the Bharat Bandh. The party workers staged dharna and blocked railway tracks in many places including Bhubaneswar, Khurda Road, Puri, Berhampur, Sambalpur and Balasore. At least ten trains were cancelled in the jurisdiction of the East Coast Railway. While several trains were delayed due to the rail roko in different places, a large number of passengers were stranded at railway stations, officials said. In state capital Bhubaneswar, Congress workers staged road blockade at many places disrupting movement of vehicles on the National Highway through the city. The impact of bandh was also felt in the tourist destination of Konark as bandh supporters locked the ticket counter of Sun Temple. As a result, a large number of tourists failed to visit the monument, officials said. 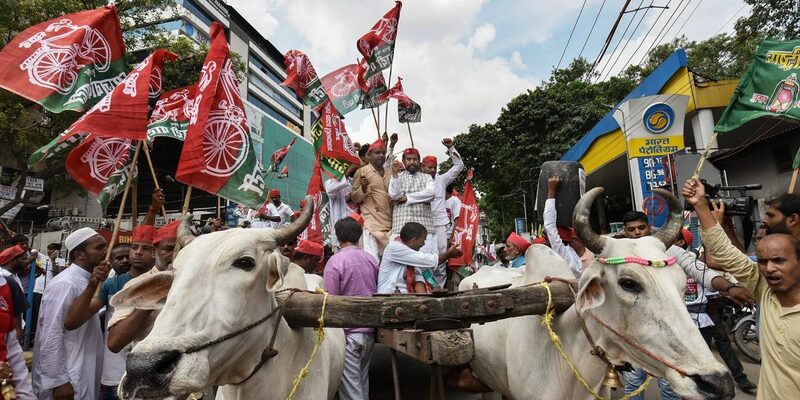 Normal life was thrown out of gear during the protest, which is supported in the state by the Janata Dal (Secular), an ally of the Congress in the coalition government, as well as other parties. Roads in the city wore a deserted look since government buses, private taxis and most of the autorickshaws did not ply. Business establishments, shops, malls, certain private enterprises remained closed. BJP state chief B.S. Yeddyurappa condemned the shutdown and called it a conspiracy by the coalition government of the Congress and JD(S) for forcibly making the bandh successful. “It’s an ill-intended bandh to trouble the common man and misleads them. This bandh is benefiting only the extortionists. People know what’s happening. Nowhere in the country it’s successful except for Karnataka because it’s a conspiracy of the Congress and JD(S),” Yeddyurappa said. 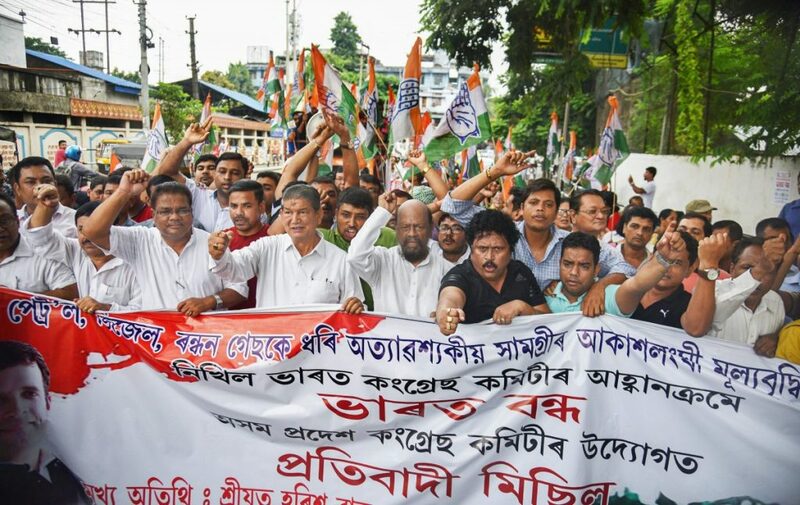 The protest led by Congress and various opposition parties to protest a hike in fuel prices is underway in the Kolkata and the suburbs amidst strict measures by the West Bengal government. The ruling Trinamool Congress had expressed support on the issues, including the depreciation of the rupee, but said it was against a bandh. The Congress has called the bandh for six hours from 9 am, while the CPI(M)-led Left Front called a 12-hour bandh starting from 6 am. A senior official of the Kolkata Traffic Police, when contacted, said all measures have been taken to ensure that normal life was not impacted by the bandh. “We will take strict action against those who will try to hamper normal life, put up blockades, try to stop people from going to their work or open their business enterprises. We have employed enough officers for the purpose. Hope everything will be fine,” he said. Bandh supporters protested on the railway tracks at Jadavpur station which was, however, withdrawn after commuters started protesting. Additional police personnel were deployed in the state to ensure that there was no disruption or violence in connection with the bandh call. State transport undertakings will run more buses than usual to ensure that commuters are not inconvenienced, senior state minister Partha Chatterjee had announced Sunday. The Bharatiya Janata Party has dubbed the country-wide protest call given by the Congress and several other parties an attempt to spread rumour and confusion among the masses and has said the people will “puncture the grand alliance balloon” floated by the main opposition party. Union minister and BJP leader Mukhtar Abbas Naqvi took on the Congress, saying it has been a “history-sheeter” on the issue of price rise whenever it was in power and is now shedding crocodile tears. Accusing the opposition party of trying to create a “negative atmosphere” in the country since Prime Minister Narendra Modi came to power in May 2014, he wondered if some “invisible hand” gave “supari” (contract) to destroy the progress India has made. “The Congress is a cruise of corruption and whichever party joins it will sink with it,” he said, adding this is the reason several opposition parties have kept away from the Bharat Bandh call given by the opposition party. Naqvi added that since Modi had taken over in May 2014, inflation hovered around 11%, which the prime minister has now brought down to around 4%. “Through violence and anarchy it is trying to spread rumour and confusion among the masses,” the BJP leader said.